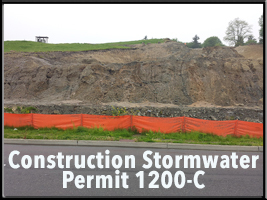 Soon the Department of Environmental Quality will be making changes to the Oregon 1200C permit. To prepare yourself for the changes, and what they could mean for erosion and sediment control management, don't miss this full-day workshop. The current 1200C permit will be reviewed, and the instructor will relate many the most up-to-date best management practices in sediment and erosion control. Interactive discussion around the potential new requirements and how to prepare for them will be encouraged. From a review of the origins of stormwater policy and NPDES structure, to a discussion of permit requirements and BMP’s for Source Control, Conveyance and Treatment, NWETC’s Erosion and Sediment Control Workshop is designed specifically to address the needs of Oregon’s stormwater field personnel and managers, and to prepare them for the upcoming changes. The intended audience is field personnel and managers from businesses and municipalities who implement and oversee the Oregon 1200C permit. This workshop is appropriate for attendees who are new to the field as well as seasoned experts.